With any PV Solar Panel system it is imperative that a charge controller is used to get the maximum efficiency from the system. Victron Energy solar charge controllers have been designed with an extremely clever algorithm that allows the system to capture the available solar energy efficiently and effectively. Depending on the size of the PV array and on the application, either a PWM or MPPT solar charge controller can be utilised. 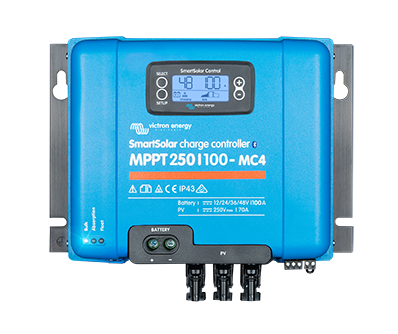 The options are vast when it comes to solar charge controllers including PWM or MPPT ranges and various voltages and amp ratings. PWM stands for “Pulse Width Modulation” and MPPT stands for “Maximum Power Point Tracking”. Both have advantages in their particular field of application. All solar charge controllers come with Victron's 5 year world wide limited warranty so you can be safe in the knowledge that when you are buying Victron products, you are buying the best.